Womens Team Basics Active-Dry Polyester Athletic Shorts-Closeout. Moisture Wicking Active Dry Mesh 100% Polyester. 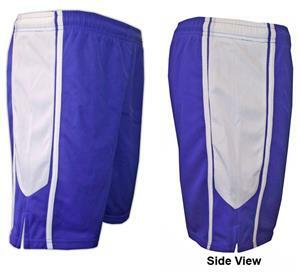 Durable 3-4 needle covered waistband with internal drawcord. Rise differential for better fit in waist and seat. Dura-stitched at stress points. Active-Dry performance fibers and ventilating knit wick moisture and heat away from the body for a cooler, dryer, more comfortable fit. Shorts may have either a colored drawstring or a white drawstring. Your order may contain colored or white drawstrings or a mixture of both. A great value for your entire team! Moisture Wicking Active Dry Mesh 100% Polyester. Active-Dry performance fibers and ventilating knit wick moisture and heat away from the body for a cooler, dryer, more comfortable fit. RELAXED WAIST GARMENT MEASUREMENTS 24-26" 28-30" 33-35" 36-38" 40-42"
GARMENT INSEAM MEASUREMENTS 7.25-8.25" 7.25-8.25" 7-8" 7-8" 7.25-8.25"
Great deal. Got them for my flag football team.